AVAILABLE FOR COMMERCIAL OR EDITORIAL LICENSING FROM GETTY IMAGES. Please go to www.gettyimages.com and search for image # 173083835. 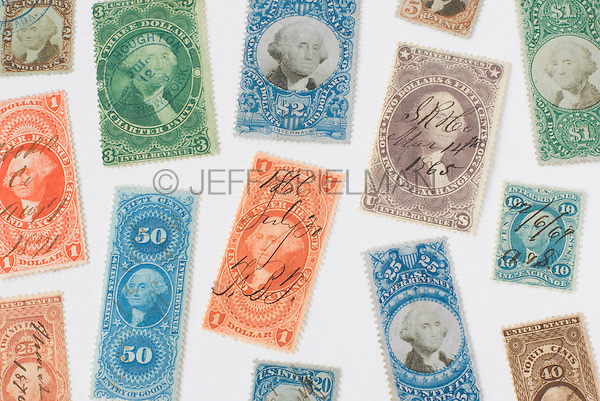 Antique United States Revenue Stamps (Tax Stamps) issued by the U.S. government between the years 1862 and 1872. These stamps, featuring a portrait of President George Washington, were used on documents and other paper items during the Civil War and in the following decade to show proof of payment of federal taxes.